Bullying, violence, blood, gore, death, sexual content, murder (+ attempted), drug use, swearing, etc. Yeah. This is that kind of movie. Bursting at the seams with Gen Z and Millennial rage and playing like Spring Breakers-meets-The Purge, Assassination Nation goes off like a shotgun blast aimed squarely at the society that derisively christened them “snowflakes” without the inherent irony of quoting another rage-fueled take-down of the above mentioned toxic masculinity. And much like an actual shotgun blast, it makes a loud, glorious mess in the process as it blows everything in its targeted path to smithereens. The ones eventually doing the shooting: a close-knit group of girl friends in high school whose day-to-day goings on primarily include partying and carefully navigating the real world and online social landscape of their small town. As a series of malicious data hacks begin to expose the hidden lives of many of the town’s leadership figures, paranoia begins to set in and old resentments and grudges surface before violently boiling over as most of the town’s secrets are revealed. The townspeople turn on each other, before the mob violence ultimately targets the girls for the perceived slutty behavior that more “rational” heads claim must be the cause of the widespread corruption. The central group is likable enough, both due to the script that shades in their personalities beyond blank slates and tokenism in the case of trans girl Bex (Hari Nef) and Em (Abra). Not content to make write pure martyrs for the audience to feel sympathy for their later victimization and ultimate empowerment, the girls are not cut-and-dry good as they engage in sexting, drugs, and other what-would-be-considered illicit behavior, and they watch the initial outpouring of salacious scandal with amusement and aloofness,. Writer/director Sam Levinson doesn’t outright condemn their apathy, despite the amount of trouble it eventually causes them. Levinson pulls out a boatload of nifty tricks to bring his vision to life, from De Palma-style split-screen and tri-color symbolism to crazy camera angles and amped up blood and gore. Stylized and blunt as it is, the film is an experience that will divide audience appreciation severely along generational lines; older audiences might be horrified to see what these characters find amusing or acceptable. Personally, I found the film’s first half mostly obnoxious and slow to get to its blatantly obvious point. There’s surprisingly little intrigue around who or what is causing the hacks, perhaps mirroring the core characters’ disinterest and sense of inevitability towards what’s going on. Once things go fully sideways for everyone in the second half, the film becomes more interesting and engaging, though it feels as though the film takes some shortcuts to get there. This is what may be dubbed as its Purge section, but unlike the violence of those films it’s not aiming for fun or thrills. Centered around a long-take home invasion, this is genuinely upsetting, outrageously brutal stuff as the mob comes to burn its witches. It’s a shame that this bravura sequence precedes an ending that feels like it comes just as the narrative reaches what feels like it’s biggest moment and its themes become the most focused and clear. I did not particularly enjoy the film, but then it may not be meant to be wholly enjoyed, but an outlet for a desperate, pent-up contempt. Scattershot as it is, its statement rings abundantly clear, looking around at the current state of things and calling out all the horrible, normalized behaviors that caused it with utmost disdain and venom, and reserving plenty for the people who encourage it and blame the young. It’s an angry work, deeply, rightfully so, and I admire it for that much. 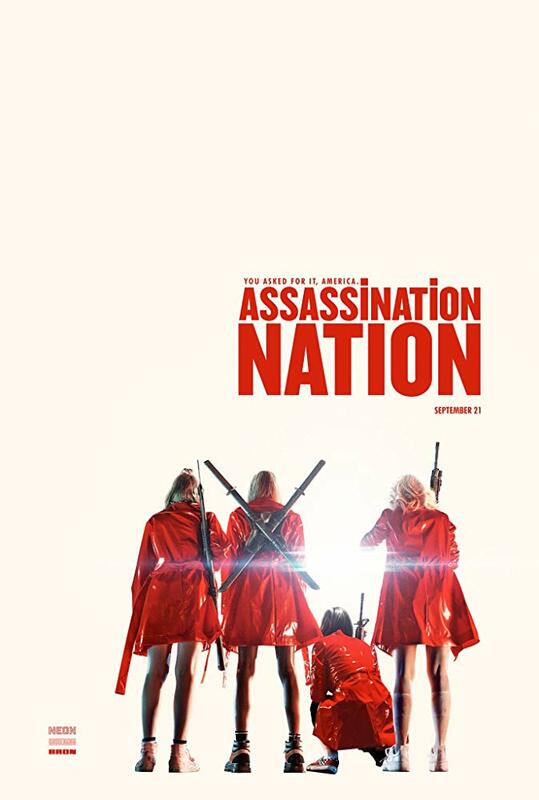 Assassination Nation is currently playing in theaters everywhere.